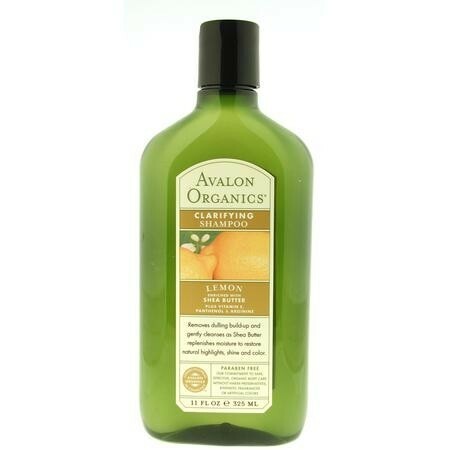 Certified organic lemon helps remove dulling residues with its acidic properties. Shea butter is rich in fatty acid triglycerides, which add luxurious shine to hair. Designed to give your hair and scalp the optimum benefits of natural botanicals, this shampoo contains our certified organic herbal blend and certified organic lemon oil, our artfully-crafted gentle cleansing system of coconut and palm kernel-derived cleansers, special skin and hair conditioners like our vitamin and amino acid complex of arginine, panthenol and vitamin E, plus shea butter. Apply to wet hair, massage into rich lather, then rinse. For best results, use Lemon Clarifying Conditioner. Purified water, cocamidopropyl betaine, disodium cocoamphodiacetate, sodium cocoyl sarcosinate, coconut acid, babassuamidopropalkonium chloride, organic citrus limonum (lemon) peel(1)), calendula officinalis (calendula) flower(1) and chamomilla recutita (chamomile) flower(2) extracts, butyrospermum parkii (shea butter), vegetable glycerin, bisabolol (chamomile), ethylhexylglycerin, arginine (amino acid), panthenol (pro-vitamin B5), tocopherol (vitamin E), organic citrus medica limonum (lemon) peel oil(1) and other essential oils.